When you look at the top of your home or office what do you see? Most will simply say "the roof." Others may answer quite differently, such as with "problems," "potential," or even "money pit." If any of the latter are what come to mind given a visual inspection of your home's roof than it may be time to call a roofer. 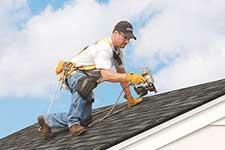 Let's explore a few of the most common reasons that people reach out to professional roofers. While most roofing styles do not require extensive maintenance, there may be times when a roofer should be contacted. General roof cleaning can help extend the life of your roof and annual inspections to search for failing roofing areas that are due to age, storm damage or natural debris that causes shingles to break, bend or go missing. Roof maintenance can also include gutter care that will help prevent water leaks. It is important to have roofing issues taken care of as soon as they become noticeable. Missing or damaged shingles will likely lead to roof leaks, which will ultimately result in structural and interior damage to your home. Contacting a professional roofer is important to do immediately if you suspect roof damage or have already detected a roof leak, as letting the issues go on with improper repairs will result in growing issues. Most shingle roofing styles have a lifespan of 15-30 years, depending on the product. As the lifespan nears completion it will often become visible that the roof is falling into despair. Shingles will begin to crack or curl and some may even go missing. Replacing the roof prior to it being absolutely necessary can often prove cheaper than waiting until additional problems come about as a result of the aged roof. Building a new house is exciting and topping it off just right is critical to ensure the whole home is structurally sound and looks great. A professional roofing company can work with you to figure out your best options based on your desired look, budget and other wants and needs.